20110803 - Up and at the desk all day. 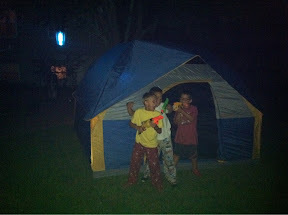 Dinner with the fam-D. After dinner J&I ran out to get gas a hair cut and some supplies for tonights camp out; J is having two of his buddies sleep over in a tent in our backyard. When we got home one of his buds Connor was already there playing with G. We got our stuff unloaded and L&I sat on the back patio enjoying this perfect evening. Pretty soon we were summoned to the play room where the JG and Connor gave us an unforgettable performance of Thriller and Sweet Home Alabama :-) Then Donovan showed up and the fun really got going. G tried his best to keep up, but with no nap today... well let's just say he was a little grumpy and in their faces... I read a book to G and got him settled in and then onto the back porch with the laptop as the boys ran through the pitch black yard having a nerf war. They got settled into the tent and I had stashed some Oreos and water bottles in there for them. The had their snack, told some stories, farted and laughed and laughed. They got to sleep with the bug zapper as a night light and.